These instruments are used to test the temperatures of bulk liquids in storage or transport. While conventional test instruments may be unsuitable due to difficult access, these instruments may be lowered into the material and a sample withdrawn to ensure a reliable temperature reading. Two types of cases are available, one to accept 6.5mm diameter solid stem thermometer 305mm long. 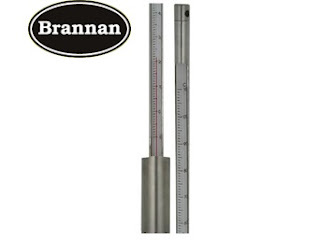 The other has an enclosed scale type thermometer insert, 17mm diameter. A variety of temperature ranges are possible for the solid stem type - the temperature ranges listed are those most frequently requested. The thermometer inserts are red spirit filled.